So let’s be honest. 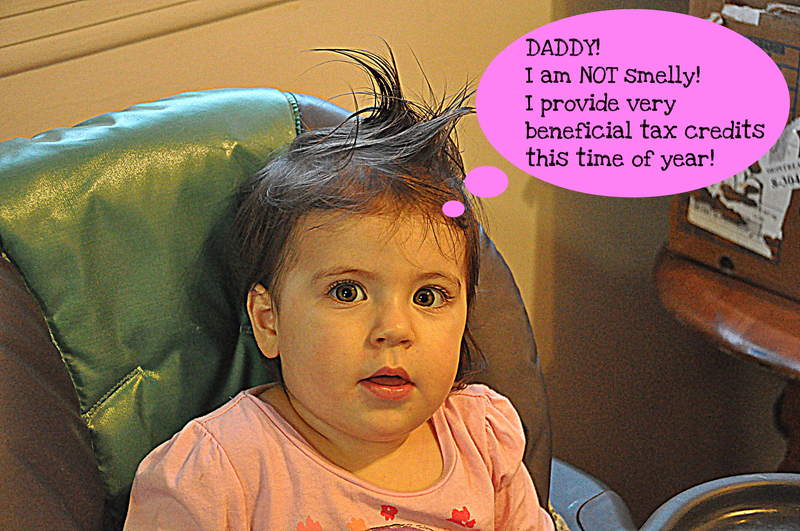 Babies are smelly. They’re the cutest things in the world (other than some breeds of puppies) but they poop themselves, they eat with their hands and there is a constant flow of green stuff flowing from their noses (and sometimes their eyes). Ew. But we love our kids…they’re the lights of our lives, the reason we get up in the morning. We wait with bated breath as they achieve the next milestone in their lives (mine’s about to walk!). There are several things, though, that they don’t tell you before you have kids….the tax benefits! Woo! If you’re one of the brave souls who does their own taxes, make sure you don’t claim daycare expenses on your Quebec taxes if your child is in a subsidized daycare (i.e $7/day). They aren’t eligible for the Quebec credit and you’re likely to get audited if you try to make the claim (even if you did it by accident!). Disclaimer – To repeat an earlier-blogged piece of advice, we at the Offices of The Funny Accountant do not condone procreating for the purpose of securing tax credits. Tax Tip served! Double digits for The Funny Accountant. For those of you with kids, enjoy them during this holiday season! Happy Easter, Passover, Magha Puja, Holi and all others big and small. Previous Post Tax Tip #9: AKA Love Potion #9! Next Post Tax Tip Monday – Small Businesses: Got One? Thinking About Launching One?